We are officially in North Carolina a little over two weeks now and the Summer heat is in full force. I think it’s been close to 100 every day since we moved in. I’m not complaining in the least. The humidity is doing wonders for my hair. I actually have some body to it. Woot! Woot! The warm weather is definitely a calling for a refreshing Summer appetizer. Our Fruit Salsa is just that. Plus, it’s super quick and easy to put together. I have slowly but surely started to find my way around. I can actually get to the grocery store without using the navigation. It’s only 3 miles down the ride, but it still feels like an accomplishment. We decided to have friends and family over last weekend before I left to head back to New York City for Disney Moms on the road event. If you missed my video all about that you can find it HERE. It was seriously a crazy idea, but I relied upon my quick and easy recipes to get me through. 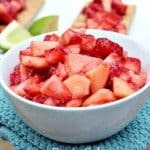 This fruit salsa was quick and easy to whip up and I felt good knowing the kids were eating fruit and graham crackers rather than chips and dip. Plus, it made me feel good about not wreaking my eating habits that I started since doing the 21 Day Fix. I’ve stuck to the meal planning and it’s definitely continuing to work. I’m starting the 21 Day Fix Extreme next week and can’t wait to see and feel my results. If you’ve thought about any beachbody program, I would highly recommend the 21 Day Fix program and would love to have you join along on my journey by signing up HERE. 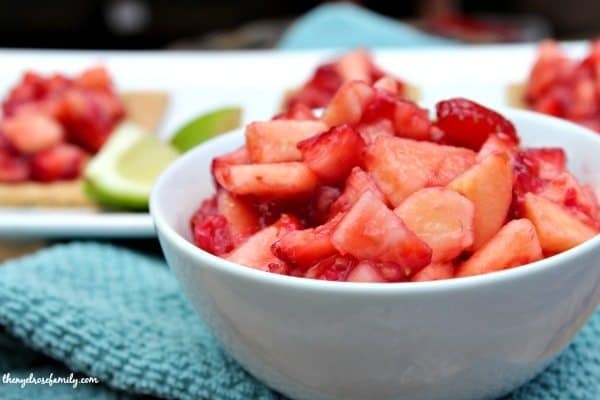 What I can tell you is that this Fruit Salsa is the perfect refreshing appetizer and it’s done in minutes, which means you can spend more time with your guests rather than in the kitchen. Although, I’m definitely finding I love spending time in my new kitchen because it’s so much brighter and there’s a ton more space, which is actually resulting in less of a mess and less accidents for this accident prone girl. 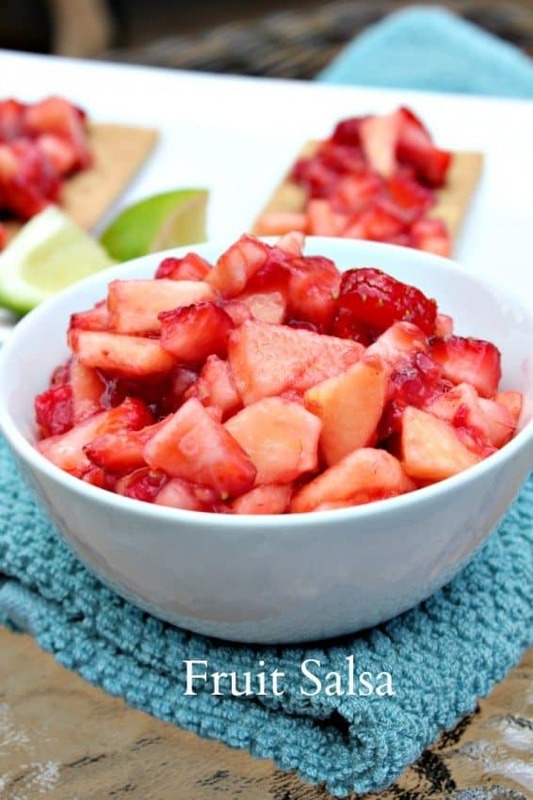 A refreshing and easy fruit salsa perfect as a summer appetizer. 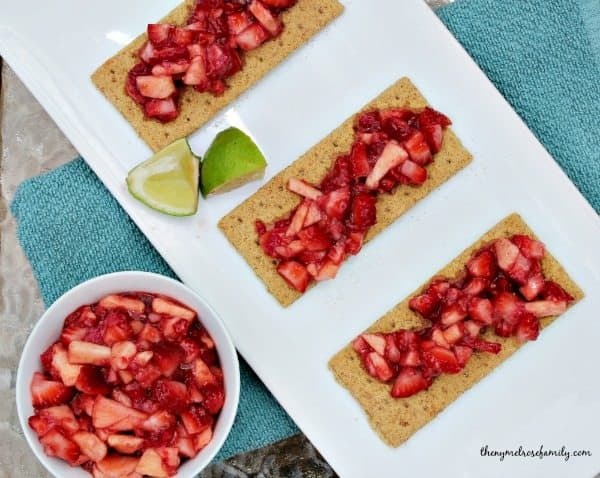 Combine all fruit in a large mixing bowl and mix in the raspberry preserves and brown sugar. Chill before serving. 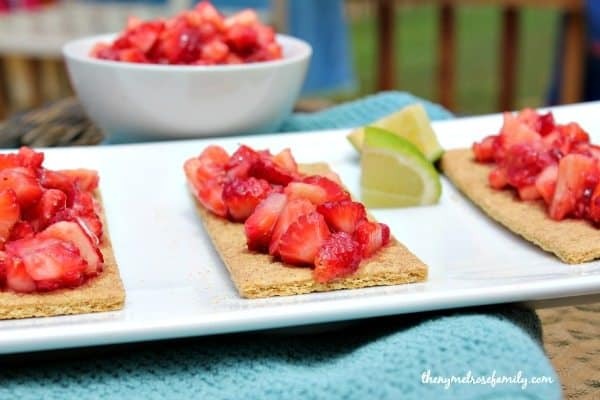 Use the cinnamon graham crackers to dip into the fruit salsa.